The Embera and Wounan are people of the same genetic stock, although they have developed two distinct languages. They live over a wide area from Panama, into Columbia and even into Ecuador. Because they are a jungle people, who live in small communities, sometimes deep in the jungle, it is hard to get an accurate count of the numbers in Panama, since many live up into the otherwise impenetrable Darien jungle. Because several groups of these people have lived in the area which is now the Chagres National Park and are within a couple of hours of Panama city, via car or bus and dug out canoe, they are often visited by tour groups from hotels and cruise ships. They are an agricultural people who traditionally subsisted by growing their own crops, fishing, and hunting. 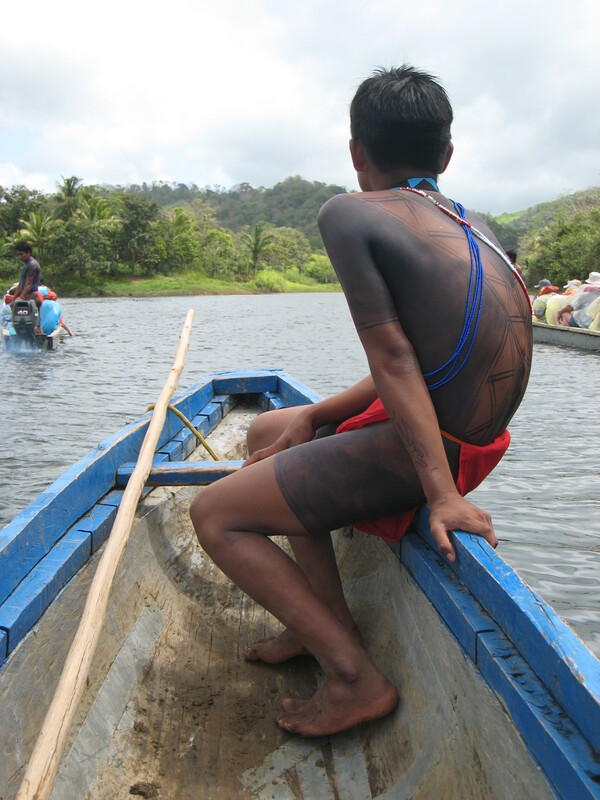 They travel by foot and canoes or piraguas dug out from large tree trunks. They are a monogamous people, traditionally with arranged marriages, although that is changing. There are estimated to be between 35,000 to 80,000 Embera living within Panama. Rarely will you see these folks in Panama City since they know they will only end up with low-end jobs. There is a big commitment to the extended family, the village, and preserving traditional Embera culture. In Central Panama you will find Embera and Wounan villages which have more “adapted” to local agricultural traditions and dress. Sometimes you will find Embera/Wounan villages in which three languages are spoken: Embera, Wounan and Spanish. During the Canal Zone days they were called Chocoes and we very much looked down on, because of their traditional lifestyles and dress. People who grew up in the Canal Zone, Zonians, have told me that when they were children they were told never to leave the Canal Zone because there were cannibals out there who would eat them! Indians are second class citizens in Panama. Most Panamanians have never visited or even thought of visiting an Embera Indian village. Interestingly, as the tourist value of the Embera is being discovered, and their images appear on tourist flyers and posters, suddenly ordinary Panamanians are starting to appreciate the value of these Indigenous groups and the value of preserving their cultures. It is an authentic cultural experience, visiting folks who are trying to preserve a lifestyle that has existed pretty much the same since before Columbus came to the Americas. That’s tough in a country rapidly moving from “second” to “first” world status. It is something “right out of NATIONAL GEOGRAPHIC” and unique to Panama. These are warm, welcoming people who love to share their heritage and since their homeland is now part of the Panama national park system are unable to hunt as they traditionally have done and support themselves from tourism. It is a good model for sustainable tourism which has been good for the Embera, good for the country, good for the environment and good for Panama. These people are our friends and in large part the reason why we discovered Panama as a retirement destination. There are about 7 Embera Puru villages in Chagres National Park that are used by the various tour operators. You never know which village(s) are going to be used. Often, so as not to overwhelm a single village, a ship will use several villages. The decision as to which village will be used is made by the tour operator, the Embera village chiefs, and environmental considerations such as the depth of the rivers that must be navigated to reach the villages. And to answer the question guests always ask, “No, there are no highways to the villages that you can’t see. They are what they are.” The villages are different. Some have very primitive facilities for guests and others have put in flush toilets and tiled bathrooms for guests. I prefer the primitive! The villages are all authentic where the people live and work. Some have small schools in the villages or nearby that are provided by the government. A few have Peace Corps workers in residence. There are variations in the traditions of the villages in terms of dress and ceremonies, but they are all pretty much the same. I have a friend who is the head of the anthropology department of a European university who has studied the effect of tourism on the Embera. His research indicates that it has been very positive. Traditionally in Panama Indians are looked down on, and particularly the Embera since they were viewed as being more “primitive” because of their style of dress, or lack of dress. Suddenly these people are popping up on tourism posters and videos and the country is waking up to the tremendous treasure of Indigenous peoples. There is little oral history of the Embera people. Long before borders, and long before the creation of a country called Panama, these folks lived primarily in what is called Columbia, and remember that before the US-encouraged “revolution” in 1904, Panama wasColumbia. Today the Embera are strongest in the Darien region along the Columbian border, but about 50 years ago a few Embera, looking for a better way of life, came down from the Darien and settled in the Chagres River areas of Panama, in and around what is today known Lake Alajuela originally constructed by damming the Chagres by the US as an additional water reserve for the Canal, and known as Madden Lake. Several of these pioneers worked for the US Army teaching jungle survival techniques to soldiers and the first US astronauts. In spite of this valuable contribution, many of the US Zonians looked down on the Embera, primarily because they dressed with few clothes. They were looked on as savages, and there are accounts of people who grew up in the Zone who were told by their parents not to leave the US Canal Zone because there were “savages” and “cannibals” living in the jungles. These were hunter, gatherer people who, yes, did use arrows dipped in poison made from some of Panama’s notorious poison tree frogs. They settled around Madden Lake and the tributaries that fed the dam. They hunted, farmed, and fished, fish being one of the staples of the Embera diet. After the US turned over the Canal and US-occupied territory to Panama, Panama realized the rain forest and watershed around the Canal was essential to Canal operation, and so much of the area, including the areas in which the Embera had lived, suddenly became protected national park. So, no more agriculture and no more hunting. This was a bleak and hungry period for the Embera who suddenly saw their livelihood taken from them. A few adventure tourism groups began visiting the jungle villages, and eventually tourism has become the livelihood of the Embera living in the Chagres. They welcome tour groups to the villages where they live, introduce guests to Embera culture and sell their amazing hand-crafted baskets and carvings. This is not a “Polynesian Cultural Center”: these are real Embera living in real villages who are committed to preserving a traditional lifestyle and sharing their traditional values and art with the more “civilized” world. They are articulate, sensitive, intelligent people who are very aware of the world outsidetheir village, yet manage to preserve a culture, and maybe even an innocence that is welcoming and accepting of others who come from outside and who have different lifestyles and values. I have often pointed out to my friend, Erito Barrigon, who is the chief of one of the villages, how ironic it is that here he lives in a tiny palm hut in the middle of the jungle, and people come from all over the world to listen and hang onto his every word. If you are on a cruise, or visiting Panama, a visit to an Embera village is an experience not to be missed. It is like stepping into the pages of NATIONAL GEOGRAPHIC. It is an experience that is unique to Panama. And the amazing, and tragic, thing is that so few Panamanians have ever taken advantage of the opportunity to visit and get to know their Embera neighbors. The Embera Puru community of San Juan, with only 123 people, is the least touristy of the Embera villages, probably because it is a little more difficult to reach, but these are wonderful people, warm, hospitable and anxious to share. It is well worth a visit! Passengers on cruise ships stopping in Panama often have the opportunity of visiting an Embera village. You can also make the journey yourself. From Panama City you take the road to Colon, outside the city past where Corridor Norte intersects the road to Colon, you turn off to the tiny village of Nuevo Vigia, on Lago Alajue or Madden Lake. From here you take a dug out canoe across the lake and up the river for a spectacular 1.5 hour trip. On our most recent trip we saw amazing birds, turtles, even a monkey and a huge alligator! Anne Barrigon [ http://www.emberavillagetours.com] does conduct independent tours to the authentic Embera Indian village at Rio San Juan de Pequini. You can contact Anne directly for information. Hers is an interesting story. In 1956 five missionaries were killed in Equador and their story was immortalized in a book written by the wife of one of the martyred missionaries called, “THROUGH GATES OF SPENDOR.” In 2004 a Christian movie company decided to make a movie about that story and used the Embera village of Rio San Juan de Pequini as a setting for filming, using the Embera to play the role of the Ecuadorian Indians. The movie was eventually released in 2006 as “THE END OF THE SPEAR.” Anne Barrigon worked on the film . . . and ended up falling in love with and later marrying one of the Embera men. And and her husband live in Panama City and she conducts tours to the village. Prices depend on the number of participants, but for 6 to 8 people run around $75-90 per person. I recommend getting to Nuevo Vigia about 9:00am which will put you back about 4:00pm. The Embera have spectacular baskets and carvings that they offer for sale at the village. Tourist money is pooled but the money from the craft work goes directly to the seller. Take enough money because the Indians don’t take American Express, or Visa or Mastercard, just US dollars (which isthe Panamanian balboa). Ship guests would always complain to me, “Richard, you should have told me to take along more money! There were so many beautiful things I wanted to buy!” Take some money and spread it around. Don’t assume . . . well, I paid $95 for the tour . . . of that amount only about $15 goes to the Embera tribe. And if you buy something, have your picture taken with the person who made it: it will make the souvenir so much more meaningful! And this is not Mexico, so don’t bargain. Sometimes the artist will offer you a “special price” on the spot: take it! If not, it is polite to say you really like something and ask for a “special price” and they may knock off 5%. Some of my worst souvenirs are where I beat someone down on the price to save $5 . . . and then went back on the ship and dropped $20 into the slot machines without thinking. Am I shilling? YOU BET! These are my friends and when you see the quality of the craftsmanship, you will be happy to pay them for their work. You will be amazed to learn of the many plants the Embera use for natural healing and to hear the stories of modern pharmaceutical companies who have visited to learn the secrets of jungle plants.